As more and more people use their mobile devices to access the Internet and do their daily tasks, companies such as LinkedIn have been aggressively ramping up their mobile app development to meet the needs of their device-toting user base. The look and design of the apps have evolved over time to give LinkedIn users a clear picture of the data they are trying to retrieve in an easy-to-read format. In addition, the number of LinkedIn apps has increased over time to keep the user experience simple and effective. Rather than having one bloated app that forces users to access all the different LinkedIn functions, the company decided to develop stand-alone mobile apps that focus on a specific function to allow users to better use these functions on their mobile devices. These can be used separately or in conjunction with LinkedIn’s main mobile app. You can always look at LinkedIn’s different mobile offerings by checking out their mobile page. 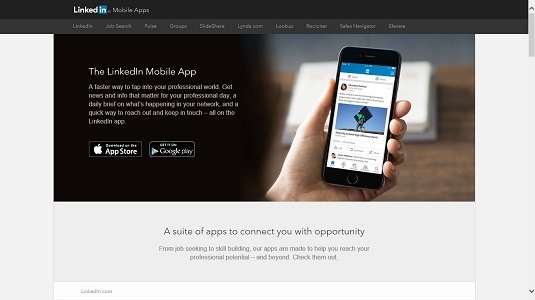 Learn about the different LinkedIn mobile apps. LinkedIn mobile app: The main LinkedIn app allows you to interact with LinkedIn the same way you would when using your desktop or laptop computer. You can view your news feed of friends’ stories, update your profile, talk to your connections, add new people to your network, or search for more information. LinkedIn Job Search: This targeted app allows you to search and filter the job openings on the LinkedIn job board to find jobs where you can apply. This app also includes the functionality that lets you see who you know at the company you’re applying to, as well as information about the person who posted the job opening. You can apply for jobs through the app with a couple of taps, and track the jobs that you’ve looked at, applied, or saved. You can set up notifications on your mobile device to hear when jobs become available to apply for or if a targeted job posting is about to expire. LinkedIn Groups: If you’re a big user of LinkedIn Groups, then this app is for you. It allows you to monitor and contribute to the discussions in the LinkedIn Groups where you are a member, as well as give you the ability to post new discussions to those groups from your mobile device. LinkedIn Lookup: This app is designed for use by workers in medium to large companies, and is meant to help you find, learn, and connect with co-workers in your own company, regardless of whether that co-worker is in your first-degree network. The app allows you to search by the person’s title, skills, expertise, name, and more. You can review any co-worker’s profile and contact her directly using the information in the app. LinkedIn Pulse: Stay up to date on the news and information that matters to you. Read up on the influencers, companies, and industries you are following with this Pulse app. You can also see what your peers are viewing. The mobile app goes further than the desktop, allowing you to save stories with a swipe of your finger to read at a later date. You can “swipe left” to indicate to Pulse that you didn’t like that content, which will help Pulse tailor future news feeds for you. You can also set up Smart Notifications that let you know when your connections are mentioned in the news. LinkedIn SlideShare: This app gives you mobile access to over 18 million slide presentations, information graphics, and videos that have been uploaded by LinkedIn members around the world. Learn about various topics from your network and leading industry professionals, all from the ease of your mobile device. Lynda.com: In April 2015, LinkedIn acquired Lynda.com, a subscription-based online learning website. While part of the LinkedIn family, Lynda.com developed its own stand-alone mobile app, which is available to its subscribers and allows users to access Lynda’s vast library of educational presentations to learn about thousands of different skills. Learn from the experts while on the go and advance your skills and career with Lynda’s monthly subscription and this app. You can also download this content to your mobile device for future viewing. 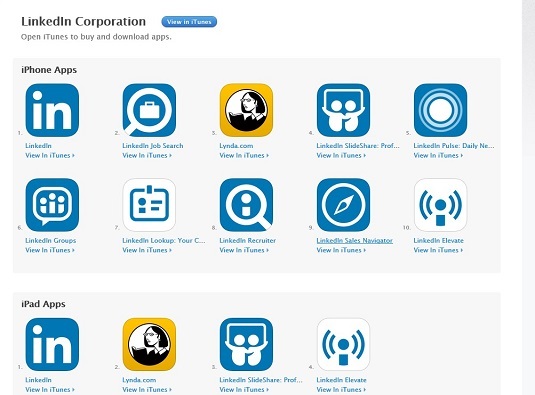 When you are on either the iTunes App Store or Google Play store, you can look for apps owned by LinkedIn by looking for apps where the developer is LinkedIn Corporation. You can see the variety of apps available for different devices for Apple iOS devices, for example. Download different LinkedIn apps to your iOS device. There are other apps available to premium users, targeting specific users like recruiters and sales professionals. Consult the LinkedIn mobile page for more information about these apps.